Vivian Campbell is offering a once in a lifetime experience for two fans in his home city, all in aid of the Northern Ireland Hospice. © Licensed to simonjacobs.com. 25/03/2018 London, UK. 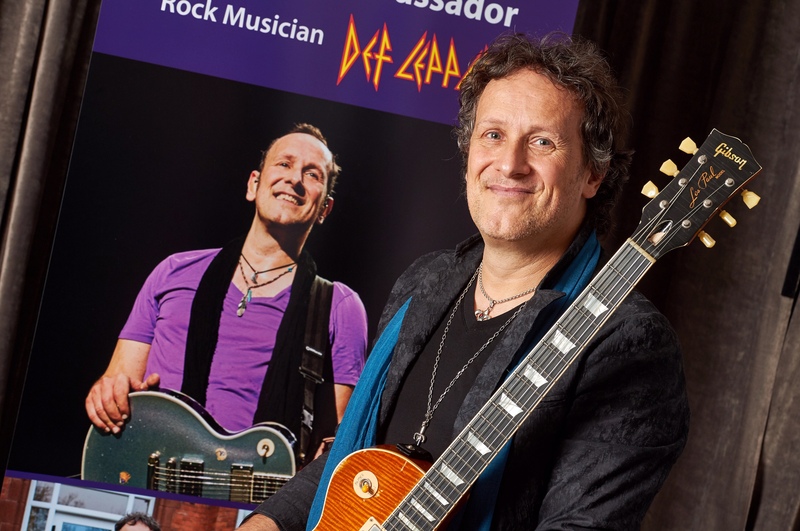 Def Leppard guitarist Vivian Campbell becomes an ambassador for the Northern Ireland Hospice Association at The Albert Hall, London. FREE PRESS AND PR USAGE. DEF Leppard’s Vivian Campbell will make two fans’ dreams come true this December when the world-famous rock band arrives in Belfast. Belfast-born Campbell, who is an Ambassador for Northern Ireland Hospice and Children’s Hospice, is offering a once-in-a-lifetime experience to have lunch with him in his native city, meet the band and enjoy VIP passes to Def Leppard’s historic Hysteria gig at the SSE Arena, as well as hotel accommodation. The experience will be won in an online auction hosted by GIVERGY.COM and will also see two fans attend the pre-show sound-check and play a song for them too. In addition to that, it will also include an autographed edition of Def Leppard’s vinyl boxset released this year and two Hysteria tour tee-shirts. Guitarist Campbell, 55, become a Northern Ireland Hospice Ambassador earlier this year, supporting the palliative care charity which cares for more than 3,500 adults and children every year. A former Rathmore Grammar School pupil who progressed in the rock scene with bands such as Dio, Whitesnake and Riverdogs, joined Def Leppard in 1992. He has released a number of top albums with the Sheffield rockers such as Slang, Euphoria, Songs from the Sparkle Lounge and most recently the self-titled ‘Def Leppard’ album which received critical acclaim. At the December 2 show in Belfast, Def Leppard will perform their global success album Hysteria in full. The album, first released in 1987, has sold over 30-million copies and includes huts such as Pour Some Sugar on Me, Love Bites, Animal and Hysteria. It is one of the most successful rock albums of all time.